Aydian Dowling for Ultimate Guy! I’m a big fan of Men’s Health magazine – while it still falls victim to some of the pitfalls of most male-centric publications, it does a pretty good job of keeping its content relatable and practical for everyday use. 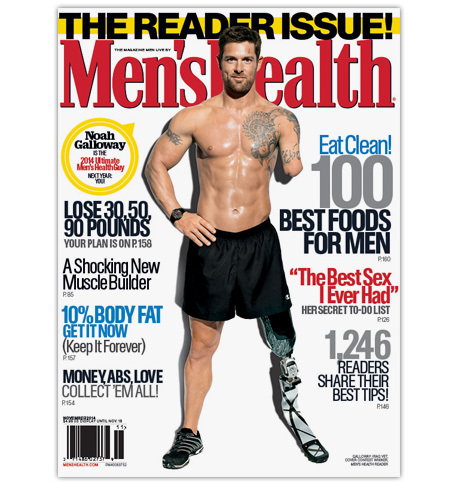 But one of my favorite things about Men’s Health is their new “Ultimate Guy” contest, now in its second year, in which readers submit pictures which are then voted on by other readers, and the winner gets his photo on the cover of the magazine. This badass was the winner of the 2014 contest. While I enjoyed the results of last year’s contest, I didn’t follow the contest itself too terribly closely, but that’s different this year – thanks mostly to this man. This is Aydian Dowling, who currently leads the pack for this years contest by more than 30,000 votes. Dowling is a very in-shape man who runs two popular YouTube channels, and has an incredible commitment to fitness. It’s yet another sign of a massive shift in the way that society perceives and responds to trans individuals, and one that’s honestly long overdue. Having a transgender man on the cover of such a popular magazine as Men’s Health would be huge for the community, which continues to be tragically under-represented in the world of fitness. In fact, Aydian is one of the forerunners in that regard, and his YouTube channel Beefheads Fitness focuses on physical training and conditioning for trans men. He also has a personal channel, ALionsFears, which documents his transition and personal life. “Most females train to build a female body, and most men train to get a more masculine body. So when you’re a biological female trying to gain a masculine physique, you’re going to train a little differently. I wanted to provide a space where we can encourage each other at the gym, even if we might not know what we’re doing.” -Dowling, in an interview with Men’s Health. I haven’t yet watched enough of his videos to get a solid idea of his training style, but the fact that he’s so passionate about helping other men like him with their fitness goals is incredibly inspiring to me. Many trans men struggle with fitness after transitioning, having been taught for most of their lives how to maintain a woman’s figure rather than a man’s. I love seeing people who recognize something that’s missing from their lives and the lives of their friends, and who take steps to make it a reality. And if anybody’s done that, it’s Aydian Dowling – he’s also founded Point 5cc Clothing, “a stealth clothing company designed to highlight transgender commonalities and create a sense of pride”, and helps raise funds for other transgender men to have top (breast removal) surgeries. Needless to say, I think this man deserves all of your votes! The audience participation only counts for about 10% of the overall contest (the rest being determined by a panel of judges who look at community involvement, healthy lifestyle, overall fitness, etc), but every vote in his favor is a terrific show of support, and will help to show the judges that this needs to happen. Go vote for Aydian Dowling here! And if you’re transgender man, or have been thinking about transitioning, also check out FTM magazine, who recently ran a feature on Dowling, and who are dedicated to the Trans-masculine community. Stay positive, and remember, I think you’re beautiful!